- Court Kings is back with a new bonus twist! Now look for TWO autographs per box, on average! Each box also includes 2 Rookies, 2 Inserts, and 1 Parallel! - Since its inception, Court Kings has been one of the most visually stunning sets of the year! - Collect four versions of the Rookies, where each subsequent version is increasingly rare--including the super short-printed Fourth Tier! - Look for on-card autographs in Fresh Paint, Heir Apparent, and Legacies Signatures! - Chase short-printed insert cards from Aurora, Le Cinque Piu Belle, and Gallery of Stars! All on-card autographs are limited to 199 or fewer copies of each! 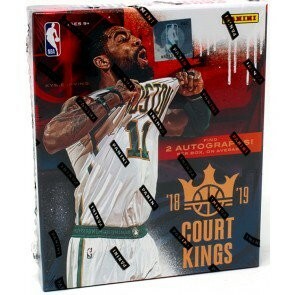 Find members of the 2018-19 NBA Rookie Class in Fresh Paint and Heir Apparent, and some of the NBA’s all-time bests in Legacies Signatures--including Kobe Bryant, Reggie Miller, and Bill Russell! Look for Sapphire versions #’d/25 or less and Masterpiece versions #’d/one-of-one!